Duruthu Full Moon Poya a very important Day for Sri Lankan. It marks Gautama Buddha’s first visit to Sri Lanka. 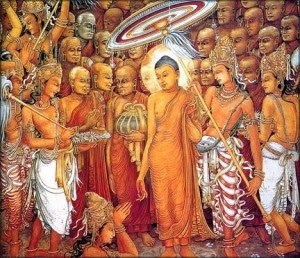 Twenty-five centuries back, nine months after his Enlightenment, the lord Gautama Buddha one visited Mahiyangana, in the Province of Uva in Sri Lanka. His main intention was to restore peace and harmony, to create a state of freedom from war or violence. The old chronicle Mahavamsa records and states "To free the beautiful land from the evil doing Yakkas". On his first visit to Sri Lanka, the lord Buddha one, arrived at a spot, where now stand the Mahiyangana stupa. When the great teacher - the Buddha was to depart after the conversion of the Yakkas of Bintenna, Mahiyangana area, for which purpose he had arrived, Sumana - a titular deity who posses a certain title or position but no real authority of this region, requested the Buddha to give him - Deity Sumana, a souvenir to which he could pay his offerings and homage. Thereupon, the Gautama Buddha, the Great Master, offered Deity Sumana, some locks of his hair. He placed it in an urn as a valuable Relic in the Mahiyangana Stupa. The battle gangs were sounded the battle drums beaten. The Yakkas poised for combat when they noticed a stranger in yellow robes - Lord Buddha appearing in the midst. The Yakkahs fled to the nearby jungles. Later, a few of them returned. They listened to Buddha’s Discourse. They laid aside their battle axes and paid reverence to Gautama Buddha. Having preached his message of PEACE, restored calm among the Yakkas, the incomparable one, returned to Jambudipa or India. The focus of Duruthu ceremonial is centered round Kelaniya, the hollowed ground where the annual Duruthu Perahera is conducted by the Kelaniya Raja Maha Viharaya. The historic vihara stands on a small mount just by the Southern Bank of Kelani river.